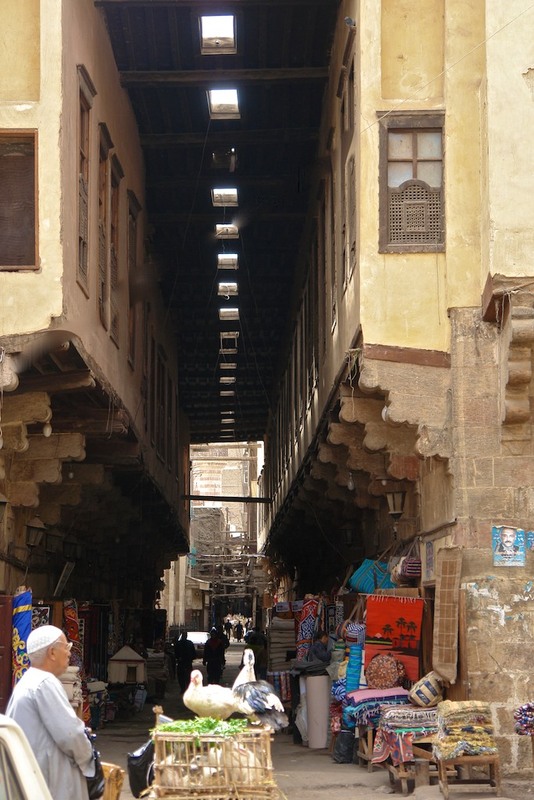 Rab’a is a type of Cairene apartment building that was built above shops. During the Mamluk dynasty, one of the most prominent Mamluk sultans, al-Zaher Baybars built a religious school, madrasa, near Bab Zuwayla in 1263. The sultan established a large apartment complex, which was named after its benefactor, al-Rab’a al-Zahiri. This area ‘beneath the apartment complex’ became known as Taht al-Rab’a. Bab al-Khalq (formerly Bab al-Karq) was one of the sixty gates of the Fatimid walled, royal city, al-Qahira. Bab al-Khalq stood near the Khalij al-Misri and the entrance into the area of Taht al-Rab’a Though the actual gate does not exist today, it got its name from the Arabic word, kharq, which means ‘hole’ because people dug a hole through the wall to pass. From Bab al-Khalq, the area of Taht al-Rab’a followed an eastern direction and ran parallel to the southern wall of al-Qahira. It joined the area of Darb al-Ahmar at Bab Zuwayla that leads to the Citadel. 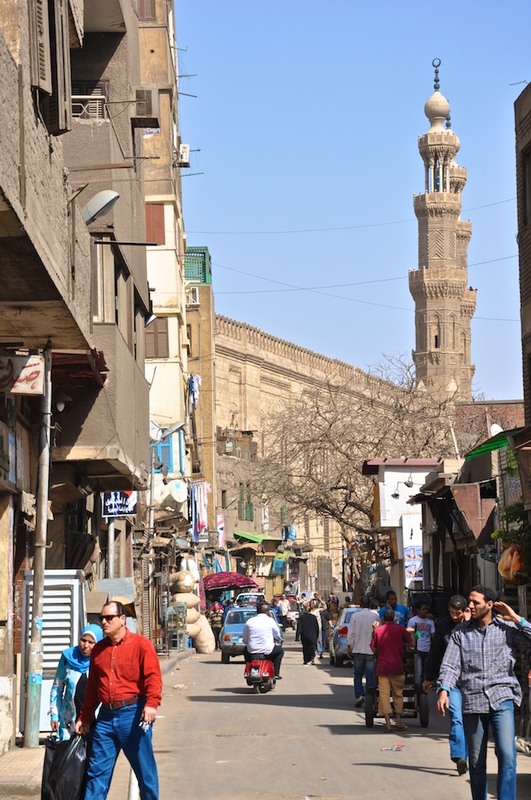 Locals still refer to the two areas as Bab al-Khalq and Taht al-Rab’a but, officially, the street is Ahmed Maher Street named after the Egyptian Prime Minister, Ahmad Maher, who was assassinated in 1945. The name change occurred after the 1952 coup d’etat. 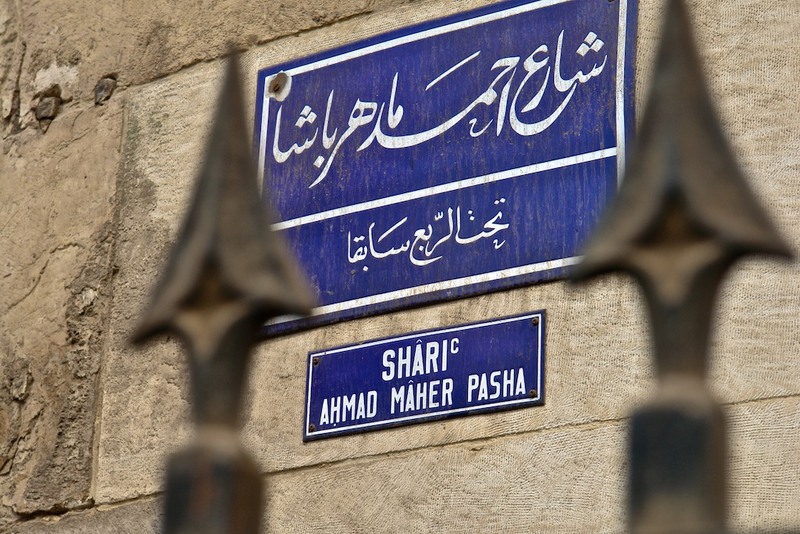 Taht al-Rab’a and Bab Khalq became Ahmad Maher Street and Ahmad Maher Square, respectively. Bab Zuwayla, which is the most well-known landmark of the area, extends over the main route, the qasaba, which ran north-south through the city. From Bab Zuwayla to the northern gate of Bab al Futuh, the main thoroughfare—the qasaba (literally translated as ‘trachea’)—bisected the city, which to this day, is still named after the Fatimid ruler, al-Mu’izz li-Din Allah. The significance of this area began in the tenth century when the Fatimids, a Shiite religious movement from Ifriqiya (present-day Tunisia), conquered Egypt in 969. Under the command of General Jawhar the Sicilian, plans for a new city were laid out. By the year 971, the Shiite caliph al-Mu’izz li-Din Allah entered the new capital, al-Qahira, in the month of Ramadan. 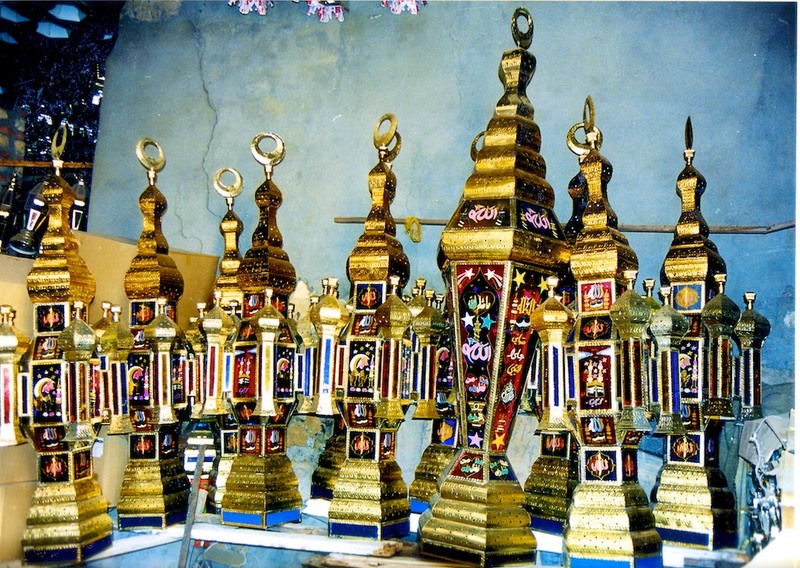 The ruler’s passageway was illuminated with thousands of lanterns (fawanees), the lantern is still a beloved symbol of Ramadan observance today. In 1092, an Armenian, Badr al-Din al Gamali, completed construction of a gate in the southern wall, and it was named, Bab Zuwayla, after Fatimid soldiers of Berber origins from the Zawila tribe quartered near the construction of the new city. (Recent restoration of Bab Zuwayla revealed that the original base of the gate was three meters below the ground and pieces of pharaonic material had been used to construct the gate.) The Mosque of Saleh Tala’i (1160) , adjacent to Bab Zuwayla, was named for the Fatimid wazir who built it. 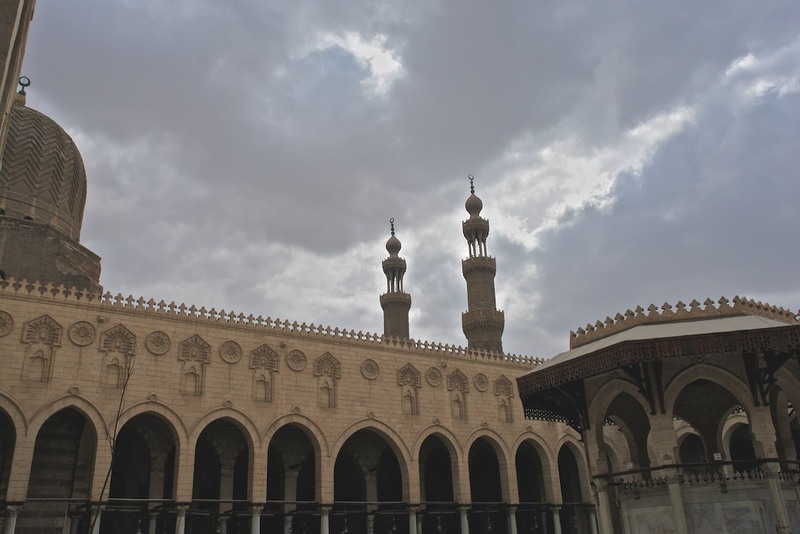 The mosque was intended as a monument for the head of Hussein but Hussein’s head was placed in a Fatimid palace or shrine on the site where the Hussein Mosque stands today. Saleh Tala’i Mosque is one of the two surviving “hanging mosques. The mosque hangs above a row of shops. The rent from the shops paid for the upkeep of the mosque and any additional construction and employment of laborers. During the Mamluk period, Sultan al-Mu’ayyad Shaykh built two minarets on the gate’s base. Over the centuries princes and dignitaries watched from the top of Bab Zuwayla as coronation and victory parades stretched from Bab al-Futuh along the qasaba. The sultan would parade his guards through the city from the northern gate to Bab Zuwayla and advance along the Darb al-Ahmar to the Citadel. This platform was the place to watch the holy shrine and caravans that marked the pilgrimage to Mecca. Bab Zuwyala was also the place for public executions. It was here that the last Mamluk Sultan, Tuman Bey was hanged. In 1176, Salah al Din built the Citadel of Cairo, a fortress on Muqattam ridge. From the Fatimid royal city, al-Qahira, the ruling class and their soldiers along with political power transferred to the Citadel. The area around the Citadel attracted development and important markets sprung up west of the Citadel. Palaces, luxurious houses and markets built up around the hippodrome, a large space reserved for military exercises, polo games, and horsemanship. For example, around a wealthy merchant’s house, individuals who produced goods lived nearby. Within the same vicinity were shops that sold the goods, their humble dwellings and traders provided services for the needs of the residence. A coffee shop, public bath, mosque with Quranic school, inn for travelers, all formed a small nucleus of the larger city. In this southern section specialized workshops produced armor, accessories for horses and special uniforms for the Mamluk guards and soldiers. Along the narrow streets of Taht al-Rab’a, there were once workshop of ironmongers who specialized in equipment and paraphernalia to adorn themselves and their horses. 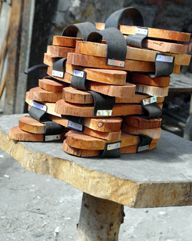 Today, small workshops of metal works remain, although the goods have changed – bird cages, tools, knives, rat traps, Ramadan lanterns. 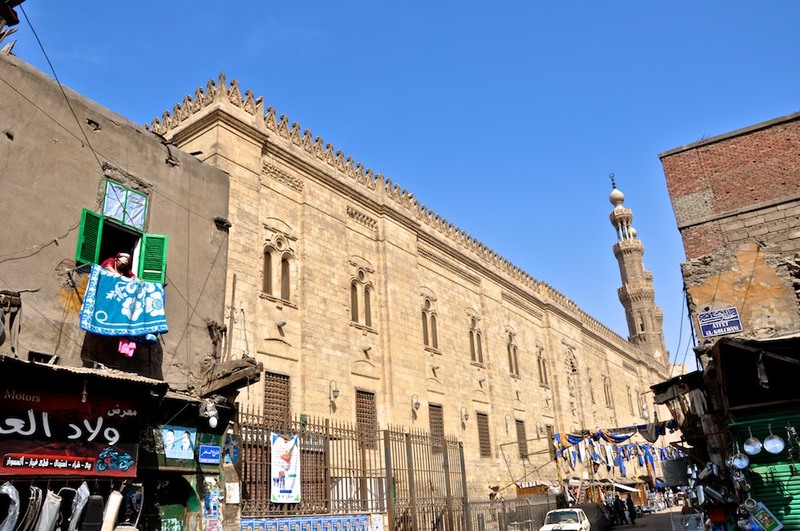 The shops along this extension of the qasaba were covered by a wooden ceiling, pierced for lighting , which is one of the best preserved examples of a covered market in Cairo. 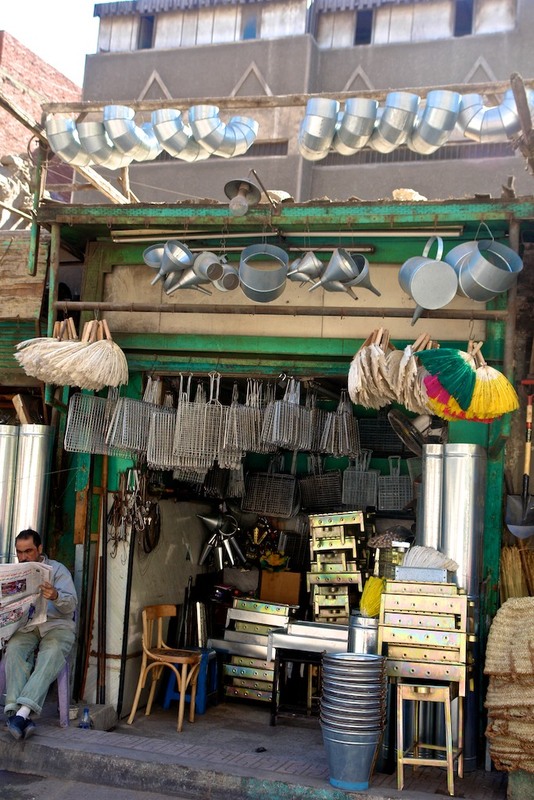 Today, this area is popularly known as al-Khiyamiya, the Tentmakers Street. 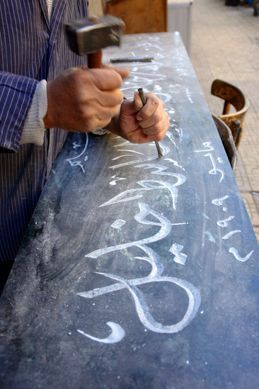 For more information on Ahmed Maher Street, buy Cairo The Family Guide and Cairo’s Street Stories.